ETFs are soaring in popularity, but don’t trade in all your mutual funds for exchange-traded funds just yet. Between 2001 and July 2014, the number of ETFs climbed from 102 to 1,375, according to the Investment Company Institute, the trade association for the mutual fund industry. Despite ETFs’ growth, low cost and tax efficiency, mutual funds still do some things better than their younger, more nimble brethren. And they still likely have a place in your portfolio. For fans of active management, mutual funds have a clear advantage: Most ETFs passively track an index rather than try to beat the market with unique strategies or prescient stock picking. “Is it better to invest your money passively, or invest your money with top management? I prefer top management, especially in 2014,” says Certified Financial Planner professional Bernard R. Wolfe, founder of Bernard R. Wolfe & Associates in Chevy Chase, Maryland. “Ever since the end of 2008, the landscape has changed. I don’t think you should just buy everything like an ETF does — it buys a sector; it buys an index, in most cases,” Wolfe says. The firm Standard and Poor’s tracks the performance of actively managed funds versus indexes in its S&P Indices Versus Active Funds U.S. Scorecard and finds that the only category that shows persistent outperformance over time by active managers is the international small-cap equity sector. In the short-term, any number of sectors might do better than their benchmark indexes or they could all do worse. Consistently picking the right sector and fund is where advisers can earn their fees. Mutual funds lend themselves more to unique investing strategies such as target-date funds. These are often designed as funds of funds with active strategies. Meanwhile, target-date ETFs tend to follow indexes. “In some cases, ETFs just don’t provide people with enough,” says Robert Stammers, CFA, director of investor education at the CFA Institute. “If you find a strategy that is unique and you find valuable, that might be a consideration” in favor of choosing a mutual fund, he says. Target-date ETFs have another drawback as well: trading costs. Commissions will seriously erode returns when investors put money into a retirement account and dollar-cost average into ETFs over the span of many years. Many mutual funds are available with no transaction fees and no sales commissions. 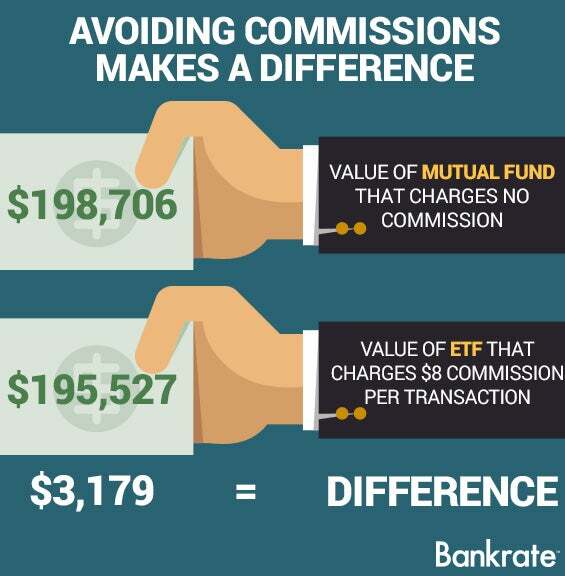 On the ETF side, buying or selling most ETFs does incur a trading commission. That can make ETFs less than ideal for investors who are making regular contributions of small amounts of money. “If your commission is $7 or $8 and you’re only buying $500 of the investment, that is a big chunk of your total investment,” says Elliott Orsillo, CFA, co-founder of Season Investments in Colorado Springs, Colorado. “In that case, it’s better to use a mutual fund,” he says. 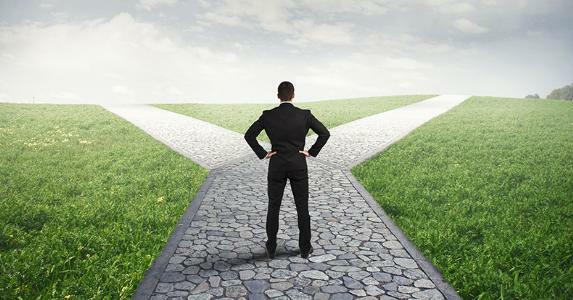 What would you choose: ETF or mutual fund? On the flip side, ETFs allow investors to buy very small portions of the investment, which has benefits for investors who are just starting out with a small account. “Since they trade like shares, you don’t have to have a minimum investment. It doesn’t make sense to buy one share of an ETF, but with many mutual funds you need $10,000 or more as a minimum initial investment,” says Stammers. “So it’s harder to get diversity with mutual funds; you may not be able to spread money around as well as you could using ETFs,” he says. These small investors could avoid commissions altogether by seeking out no-commission ETFs. Mutual funds can be expensive when it comes to taxes. Even if the mutual fund isn’t trading a bunch of stocks as part of its strategy, the act of simply redeeming shares for outgoing investors can force managers to sell shares of the investments in the fund. Any taxes incurred from the sale are paid by shareholders at the end of the year. Even if you buy the fund late in the year, you could still be paying a tax bill for events that happened before you made the investment, thanks to what are known as embedded gains. “You could buy a mutual fund today and lose $1,000. Let’s say you lose 10 percent. You could still have taxable gain at the end of the year. You’re inheriting the tax basis in those shares when you buy into a mutual fund. It may have fallen 10 percent after you bought in, but it may have been up 40 percent up prior to that,” Wolfe says. “ETFs work more like stocks and your tax basis is whatever your tax basis is, not the ETF’s tax basis,” he says. But taxes may not be the first thing to consider when choosing an investment. “One thing we advise investors is never let the tax efficiency drive the investment decision,” says Stammers. Instead, ask yourself: “What is the right strategy and what are you buying the product for?” he says. The tax concern is a moot point when purchasing mutual funds within a tax-favorable retirement vehicle such as a 401(k) or an IRA, in which gains are not taxed. If you have two products that are exactly the same, for instance, a mutual fund and an ETF that both track the Standard & Poor’s 500 index, then you can go down the list of other considerations, including the expense ratio, commissions and taxes, says Stammers. Increasing numbers of investment choices are a double-edged sword for small investors. More choices mean that individuals can really get down into the nitty-gritty and implement a specific asset allocation plan with very low cost and incredible global diversity.